In the first days of the ghetto a public library was opened at 6 Strashun Street on the site of the Mefitzei Haskalah (Disseminators of Enlightenment) library with 45,000 books. 2,500 readers were registered at the library. During the summer of 1942, about 5,000 people visited the reading room every month. The educational institutions and youth clubs also held small libraries. On the 27th of November 1941, with the end of the mass aktions, the chair of the Judenrat Anatol Fried published an order about preserving the cultural collections in the ghetto. The ghetto Jews were ordered to declare all art objects, Judaica, paintings and sculptures and to deposit them in the library. The Germans allowed Fried to bring into the ghetto, books from the YIVO building, which had remained outside the ghetto. The library was managed by the Bundist Hermann Kruk. The library also contained an archive of material about the ghetto and a department for scientific research headed by Zelig Kalmanovitch. Thousands of documents were collected in the Ghetto Archive, among them directives from the German authorities, orders from the ghetto management and police and witness testimonies from Ponary. At the beginning of 1942 Gens established a team of writers to record the history of the ghetto. 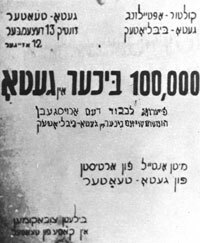 Today the ghetto library which is supervised by the culture department held a ceremony in the ghetto theatre marking the loan of the 100,000th book. Aside from the celebrations the ghetto book shop presented a display. The artistic display booth showed that despite all the pain and the troubles and despite the difficult situation of the ghetto, a heart of culture is pulsating within it. 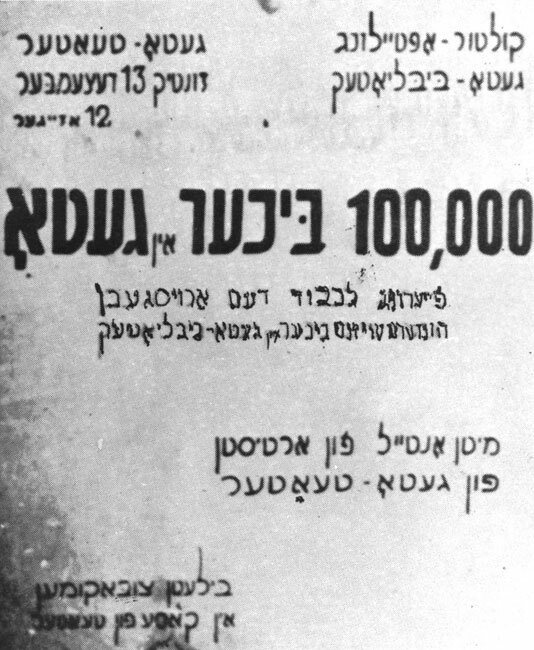 Today there was a celebration in the ghetto – the loan of the 100,000th book from the ghetto library. There was a celebration today in the theatre hall. We went… from school… there was an artistic programme. The speakers analysed the reading of the ghetto. Hundreds of people are reading in the ghetto. Reading books in the ghetto is the biggest treat that there is. Books link us to freedom; books connect us to the world. The loan of the hundred thousandth book is a great achievement for the ghetto and the ghetto can be proud of it. Members of the Einsatzstab Rosenberg (Operational Staff Rosenberg) brought the materials, primarily about Judaism and Communism, they had plundered to the YIVO building in Vilna. 40 Jews worked there, most were members of the intelligentsia and some were members of the FPO, among them Abraham Sutzkever and Szmerke Kaczerginski. Their role was to catalogue the materials to conduct scientific reviews and to prepare the materials for transport. It was painful for the Jews to see Torah scrolls used as raw material for boots and the lead stereotypes (letter press plates) of the Romm printing press, etched with the words of holy books, melted down for bullets. They smuggled valuable manuscripts, certificates and pictures into the ghetto where they hid most of them. Some of the materials were hidden outside the ghetto with Ona Simaite and others. The YIVO workers were known in the ghetto as "The Paper Brigade"
Zelig Hirsch Kalmanovitch, a Yiddish Culture researcher, was born in Latvia in 1881. He specialised in Semitic linguistics and researched Yiddish language and literature and its dissemination. With the founding of YIVO Kalmanovitch became a member of the managing committee and edited the institution's journal "YIVO Bleter" for the duration of the Second World War. During the ghetto period he was employed in the Einsatzstab Rosenberg. During the Holocaust he became increasingly religious. He supported the head of the Judenrat Jacob Gens and opposed the resistance movement, which in his opinion endangered the ghetto. At the end of September 1943 he was sent from the ghetto to the camps in Estonia where he was murdered. Kalmanovitch left behind a diary from the Holocaust period which has since been published.